I spend a LOT of time preserving our garden bounty. I don’t know about you but I sometimes find myself frustrated by the amount of time I spend processing food in the evenings. Don’t get me wrong I love preserving food. I just don’t like how inefficient some of the canning equipment seems to be. I was online one night looking for something different or better and found a tool that has made a world of difference to me. Meet the Amish water bath canner. This canner is not going to win any beauty contests (neither is that ugly outlet on the wall behind my stove) but I love, love, love this canner. If you have suffered through late night sweltering hot kitchen canning sessions then you will understand why this is such a cool product. The canner holds up to 36 pints, 56 half pints and 15 quarts! It it rectangular in shape and neatly sits across two burners leaving the other burners free for sauce pans and stock pots. 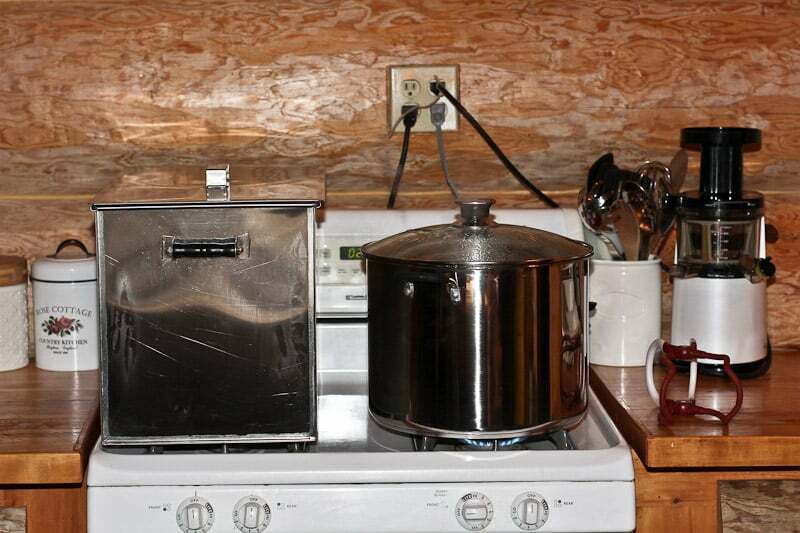 In this picture: Standard sized four burner propane stove with the Amish canner taking two burners, a large stock pot on the third and a kettle behind it on the fourth. Plenty of room, no crowding. The standard round canners in a Jumbo size hold 9 quarts and the standard size holds 7 quarts. The round canner sits on a single burner but the size and shape encroaches on a lot of precious stove space. 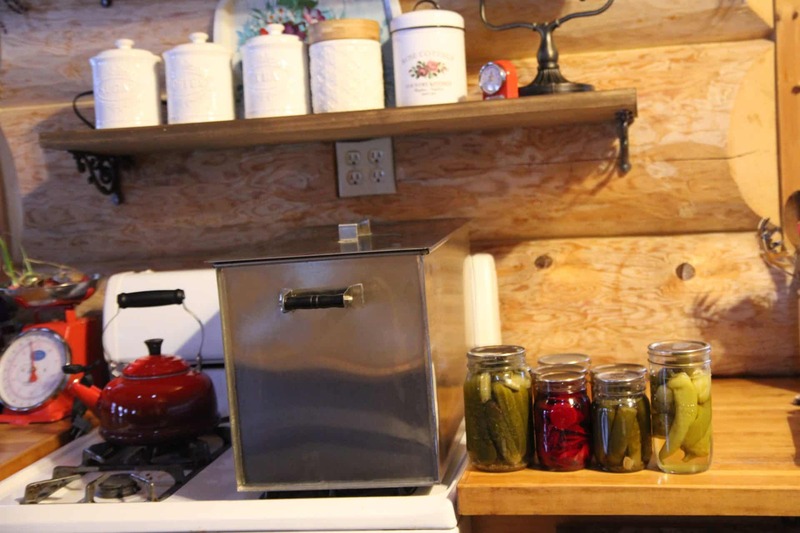 These canners are an essential item for the homestead kitchen and they are very useful when canning in small batches but … when preparing large batches you can’t beat having a canner that holds 27 pints! I found and purchased the Amish made water bath canner from Lehmans.com. It is solid & built to last. It’s not cheap at $199.99 USD. I put off buying this for a good six months while I tried to justify the cost. One day my husband said to me “order it, order it now!” I must have complained a lot when I was canning. Regardless, I am so glad I decided to buy it. I have since found the same canner on Amazon for around $30 less. I love Lehmans and supporting local but I though I better mention this option to you. Find it here. Can be used as a stockpot and will hold 50 quarts of fluid! Finding this product has improved my productivity by being able to prepare more jars in less time. It has also freed up space on my stove making my indoor set up more efficient. It has saved me time and I really value that. If you can large batches of food, it is worth looking at. I have no affiliation with Lehmans, or the Amish makers of this product. This is just an exceptional product that I wanted to share with you. How many jars can you really fit in this canner? It is important to note that in order to fill the canner to its maximum capacity you need to order a second canning shelf. It only includes one which you need for the bottom of the canner. You can fit 18 jars per layer. This equals 3 jars per row x 6 rows. With two layers you get 36 jars. From the top of your jars to the rim of the pot you are left with 3″ of space. Not a lot of room when the water gets bubbling but enough to get the job done. You can fit 28 half pints per layer. This works out to 4 jars per row x 7 rows. If you add a second tray/layer of jars the canner can hold a total of 56 jars. There will be about 5″ of space between the top of the jars and the rim of the pot. Plenty of space. You can fit 15 quart jars in this canner, in a single layer. Don’t use this canner on a glass top electric stove! That’s a lot of weight and heat to be putting on your stove – not a good idea. Cannot be used on induction burners. The canner only includes one removable shelf (for the bottom). If you want to stack jars you will need to contact the suppler by phone or email to order an extra tray (they don’t list it on the catalogue). How in the world do you lift it?? I struggle with 7 qts! It’s extremely light when it’s empty. When full, I wouldn’t even try to move it although my husband can. I use a water jug to empty it. It only takes couple of minutes at most if you use a good sized water jug. Do you know if it can be used on a smooth top electric stove? I am pretty sure the manufacturer of your stove would say “no”. It is a LOT of weight to put on a glass top. I have never tried it so I suggest you contact the supplier and see what they say and perhaps check the manual for your stove. I suspect it is a use at your own risk type of thing (which is often the case when it comes to home canning and smooth top stoves). Thank you for this post, I appreciate all of the details you included. The affiliate link is not working FYI. I would love to know if you HAVE to fill the canner, for example will your jars clank and tip if the canner is not full? I usually have a full load when I use it but yes, if I was short I would probably load it up with some empty jars so that they don’t shift around too much. Thanks for letting me know about the broken link. I appreciate it.